One common treatment protocol in the HRT clinics now is the so-called "trifecta" of testosterone cypionate, HCG and Arimidex. HCG is typically added to preserve testicular function, i.e. avoiding shrinkage "down under". This is something I discuss in more detail in my link on Testosterone and HCG. However, on this page I want to focus on another important property of HCG: it very often will preserve fertility in men as well. 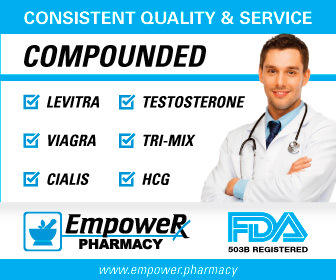 Now since HCG can also increase testosterone in many men with secondary hypogonadism, it was just a matter of time before someone got the idea that maybe some men would do just fine with HCG alone and just skip the testosterone cypionate altogether. This treatment strategy is called "HCG Monotherapy" and seems to be growing in popularity. What is interesting is that, because HCG is extremely similar to Leutinizing Hormone, some doctors and patients consider this a more natural solution than giving a man testosterone replacement therapy, because it stimulates the body's own production of testosterone. Of course, the practical side of administering HCG is that it really ramps up estradiol in most men, at least from what I have seen. So, as you'll see below, one often has to take more Arimidex than one would with just standard testosterone therapy, making this seem less natural perhaps when one considers the pharmaceutical involvement. 1) So you're on HCG Monotherapy, i.e. you not taking Clomid or receiving testosterone therapy? Can you give us a little background and let us know what made you decide to go with this decision? Fertility I assume? A. Yes HCG Mono. I am concerned about fertility. Also, my endocrinologist was not comfortable putting someone as young as me (37 at the time) on exogenous test as he viewed it as a lifelong commitment I could never quit, presumably due to testicular atrophy. So in contrast to most he was more comfortable putting me on NCG or Clomid than exogenous T, and I didnt want clomid. 2) Can you let us know your testosterone numbers before and after starting the HCG Monotherapy? How much of a testosterone boost can the typical secondary hypogonadal male get in your opinion? A. I had been tested by my gp for several years in the 320-330 range. I have increased the dosage over time and am now at 500iu 3x/week and my last testosterone reading was 610. Others I have seen have gotten as high as 700. 3) How long have you been on HCG Monotherapy and were you on Clomid or testosterone prior to this? A. It's been about a year now and was my first HRT experience. 4) How did you find a physician that knew how to handle this kind of treatment protocol? Are you currently satisfied with his or her level of expertise? My impression is that it is mostly fertility docs who handle this. Is that what you have seen? A. I looked on this endocrinologist's website and he mentioned different forms of trt, ie gels, pellets, etc and he was fairly young, so I figured he might be more open minded. I am his first HCG patient clearly: he does not seem to have any experience with it. He told me he has people on Clomid, but it won't raise libido. He tried to get me to try Wellbutrin which acts on dopamine, but i was not comfortable with that. I have been leading the charge here if you will. 5) What I have heard is that HCG will not hurt fertility parameters and will often help men in this area. Is this what you understand as well? A. Thats what I understand and it is prescribed at higher dosages as a short term fertility aid. 6) Can you tell us what dosage you are currently taking and give us some of the practical details such as needle gauge(s), needle length, self or office injections, frequency, etc.? Also, is the shot painful at all? A. My legs are muscular with no fat on them so I use a 1/2" 27 ga needle. Most people should probably use at least an inch long needle to start off with and adjust down if its feasible. I was injecting 3x/week but i have recently gone to daily injections of 250 IU to see if that will reduce estrogen. I haven't had labs done since I made the change. 7) Have you been satisifed with HCG Monotherapy - has it met your goals and been what you had hoped for? A. I have been happy with HCG monotherapy. The effects are subtle and gradual but very real. If you go in expecting a monster libido increase like you may get with a test injection that takes you up to 1200, you'll be disappointed. But there have been numerous benefits that have happened over time once I got my estrogen down a bit. 8) My understanding is that the side effects of going on HCG are basically those of having standard testosterone therapy and/or elevated estradiol? Have you personally had any side effects from taking the HCG? A. I have experienced no side effects whatsoever other than spiked estrogen. My dr monitors red blood cell count in my labs as for trt but theres been no increase there. I do not believe HCG will produce that side effect which test injections can, but i dont mind that he's monitoring it anyway just to be sure. 9) Has HCG helped you in the typical areas that men get relief from HRT, i.e. improved libido, increased morning erections and erectile strength, decreased mental fog, anxiety and depression? A. The positive effects I can report are: daily morning erections (but only once I started taking Arimidex) where they were rare before, increased penile sensitivity, much harder erection quality, and constant feeling of good mood and contentment. I was not depressed before going on it, but since going on it I feel like I am always in a good humor no matter what. The other thing is body composition has gradually changed. I am the same 6'3 205lbs I was a year ago, and I was muscular then and I lift weights regularly. But there has been a noticeable composition change with less fat and more muscle. I have not been tested for body fat, but looking at pictures and descriptions online I would estimate I have gone from around 20% body fat to around 15%. Libido has improved but it is subtle and dont expect miracles there: the difference in erectile function is much greater than the improvement in desire. 10) What about Arimidex? Have you had to take anything to control estradiol? I have read many times that in some men HCG can really ramp up estradiol. Has that been the case for you? A. I am not aware of anyone who has successfully pursued HCG mono and not needed to control estrogen. HCG produces much more estrogen than exogenous test does. I would advise anyone who tries this route to not even start it unless their doctor is monitoring their estradiol and is willing to prescribe Arimidex if estrogen gets high. Because I can almost guarantee it will and you will not get any benefits without controlling it. All of the erectile function benefits did not occur for me until about a week and a half after I started taking Arimidex, as my estradiol had gone up to 49 from half the HCG dosage I currently take. 11) What do you think the future holds for you? Will you just stay on HCG Monotherapy as long as you can? Or will you switch to standard testosterone therapy once you are longer concerned about fertility? A. At some point I am sure I will move to more of a testosterone protocol, perhaps combined with HCG to prevent testicular atrophy. My sense is you get the best of both worlds this way, and get the mood and contentment benefits of HCG with the stronger libido benefits of testosterone. I also generally think it is more safe to not allow your testicles to atrophy, even if you dont need them for fertility, but that's just my opinion/bias. In summary, I think HCG Monotherapy is a good option for a small subset of people with low testosterone which I fall into, that of younger people who are in shape and otherwise healthy. This is a small minority of people with low t, so my guess is it will never be commonly prescribed or studied in detail. I think if someone is significantly overweight they should not pursue this route, as it will be even harder to control estrogen and getting it up high may do more harm than good.